Your business is changing. With the passage of time, your company will go through various stages of the business life cycle. Learn what upcoming focuses, challenges and financing sources you will need to succeed. 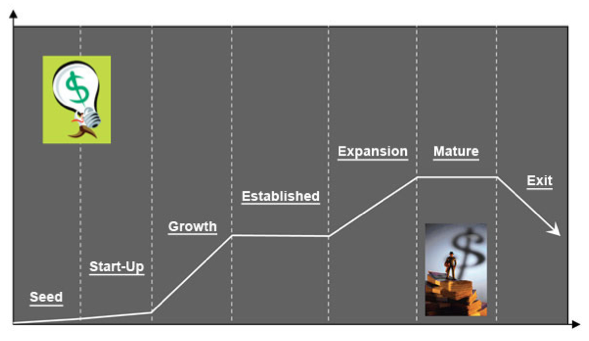 A business goes through stages of development similar to the cycle of life for the human race. Parenting strategies that work for your toddler cannot be applied to your teenager. The same goes for your small business. It will be faced with a different cycle throughout its life. What you focus on today will change and require different approaches to be successful. Challenge: Most seed stage companies will have to overcome the challenge of market acceptance and pursue one niche opportunity. Do not spread money and time resources too thin..
Focus: At this stage of the business the focus is on matching the business opportunity with your skills, experience and passions. Other focal points include: deciding on a business ownership structure, finding professional advisors, and business planning. Money Sources: Early in the business life cycle with no proven market or customers the business will rely on cash from owners, friends and family. Other potential sources include suppliers, customers, government grants and banks. In the seed stage, we have noticed many times that completion of a business plan is the biggest success factor for an emerging company. A good evaluation of the need of cash for the coming months is critical. During the first months, the company is going to develop its business model without getting revenue from sales. There are multitudes of good ideas when attempting to launch a company. But in order to be successful, the young company will need visionary managers with assiduity and flexibility in order to dynamically adapt the business model to stay in line with rapid market evolution. Launching a company and assessing the business model will often consume the equity invested by the owners. During the seed stage, the young company could readily prepare a tree year plan in order to convince new shareholders to support the next phases of development. Support the young company in its negotiations with the banks or other financial sources. Challenge: If your business is in the start-up life cycle stage, it is likely you have overestimated money needs and the time to market. The main challenge is not to burn through what little cash you have. You need to learn what profitable needs your clients have and do a reality check to see if your business is on the right track. Focus: Start-ups require establishing a customer base and market presence along with tracking and conserving cash flow. Money Sources: Owner, friends, family, suppliers, customers, grants, and banks. At this stage, the entrepreneur should put all his energy in the project. Time to market is essential. This is the risk zone. 25% of the start-ups do not reach their fifth anniversary. During the start-up stage, the budget best be revised often. More cash might be needed than expected. Unpredictable circumstances often affect plans and business model. Figures should be adapted quickly. If more cash is needed, banks are less and less a solution. Public institutions can leverage equity increase. Venture capital inflow is not easily negotiable. Challenge: The biggest challenge growth companies face is dealing with the constant range of issues bidding for more time and money. Effective management is required and a possible new business plan. Learn how to train and delegate to conquer this stage of development. Focus: Growth life cycle businesses are focused on running the business in a more formal fashion to deal with the increased sales and customers. Better accounting and management systems will have to be set-up. New employees will have to be hired to deal with the influx of business. Money Sources: Banks, profits, partnerships, grants and leasing options. The most successful entrepreneurs are masters in finding knowledgeable brains to complement his/hers DIY approach. They team up with a kindred spirit leaving each other enough space to maneuver in a common agreed upon strategy resulting from business facts. It requires maturity to surround oneself with brighter actors in less mastered domains & providing empowered strategic framing. To stay ahead of the competition, innovation will need to find a breeding ground, as this together with sales & marketing are the only money makers & growth busters in any one company no matter seize. It is a fact though that 67% of innovation stems from outside input either by addressing opinion leaders as a soundboard or external advisers helping to implement same. Sales & Marketing are like fire and water and need to be blended through business development which is the missing link to a successful go to market commercial strategy. Using an external business development organization will dazzle competition and amaze & exceed customer expectation. External assistance with proven return of joint initiative will boost your R.O.I. Challenge: It is far too easy to rest on your laurels during this life stage. You have worked hard and have earned a rest but the marketplace is relentless and competitive. Stay focused on the bigger picture. Issues like the economy, competitors or changing customer tastes can quickly end all you have work for. Focus: An established life cycle company will be focused on improvement and productivity. To compete in an established market, you will require better business practices along with automation and outsourcing to improve productivity. Money Sources: Profits, banks, investors and government. This “rethinking the model” phase is essential before additional growth is possible. The company has changed significantly due to business volumes: what was informal yesterday becomes now more formal, what has been achieved with a few people is now achieved by a larger staff, requiring more complex communication channels and some delegation of authority. Motivation from the staff also evolved: the ambitions/expectations from the 1st time joiners are not identical to those of newcomers. The child is now becoming a young adult and the operational rules are different. Entrepreneurial CEO’s are usually not well prepared to address such situations and external help from experienced peers might be very useful. CEO’s need quite a lot of courage to accept the advice from peers to help them “think out of the box” while everything worked well before further growth. Challenge: Moving into new markets requires the planning and research of a seed or start-up stage business. Focus should be on businesses that complement your existing experience and capabilities. Moving into unrelated businesses can be disastrous. Focus: Add new products or services to existing markets or expand existing business into new markets and customer types. Money Sources: Joint ventures, banks, licensing, new investors and partners, profits, banks, investors and government. It is not because you are successful in your home country that this can be copy- pasted into any other. Same goes for product and service. Many horror stories exists with financial atrocities in consequence. It is recommended to learn from these mistakes to shorten the distance between expansion challenges and it solutions as well as addressing European subsidies where possible & available. Consider the impact that the size and nature of your business can have on international business. Then gauge commitment and resources available within your company to begin expanding (-porting). There are some tricky questions to answer: Have you done market research on target markets? Are you aware of current opportunities of marketing your demand on the export market (s)? Are you sure there is an export market for your products or services? What is your knowledge of your potential export market competition? Has there been a sufficient production / staff to meet growing demand? To what extent are your products / services to be adapted to the export market? Do you know the existing constraints (licenses..) for your products / services? Does your product / service have any competitive advantage in the target market? Any idea how competitive you export will be? What Incoterms will you offer? Have you selected a payment method for your export offers? How do you deliver products locally? Did you calculate the cost of transportation (by type)? Which distribution channels do you think of? Do you already know which mix of promotional methods you can / will use? Do you have appropriate export documentation for the target market (s)? To what extent have you decided to maintain your personal contact with the customers and how? Do you have your own website in English? Do you receive export questions or export orders via your website? Do you accept payments via your website? Does your team subscribe to the expansion? Are target market languages understood, spoken and written? Challenge: Businesses in the mature stage of the life cycle will be challenged with dropping sales, profits, and negative cash flow. The biggest issue is how long the business can support a negative cash flow. Ask is it time to move back to the expansion stage or move on to the final life cycle stage…exit. Focus: Search for new opportunities and business ventures. Cutting costs and finding ways to sustain cash flow are vital for the mature stage. Money Sources: Suppliers, customers, owners, and banks. Profits, banks, investors and government. The maturity level of a company is a key stage of the life cycle of any company which will need the highest level of capital to go further then what a company has ever engaged into. Such a key momentum shows how lonely a CEO can be, even with a strong Management Team and Board besides him. It is surely the stage where the CEO mostly needs the help of a peer, not only because of the amounts taken into consideration (banks are well acquainted to help and to make profitable business …. for them) but as a captain of industry, there are lots of decisions that need a sound discussion which an experienced peer can share with the CEO. One of the main difficulties for any CEO is managing the short-term daily business and simultaneously addressing very long-term issues related to either acquisition or sales of an activity. This depth of expertise is really complex to manage where it is not acceptable to only focus on the long-term objectives, for it is requiring lots of time and management attention, as targets set might not be realized within the expected time frame. Challenge: Selling a business requires your realistic valuation. It may have been years of hard work to build the company, but what is its real value in the current market place. If you decide to close your business, the challenge is to deal with the financial and psychological aspects of a business loss. Focus: Get a proper valuation on your company. Look at your business operations, management and competitive barriers to make the company worth more to the buyer. Set-up legal buy-sell agreements along with a business transition plan. Money Sources: Find a business valuation partner. Consult with your accountant and financial advisors for the best tax strategy to sell or close-out down business. Owners of middle size companies often overestimate the value of their company. The real value, and the only value of any firm, is the check an entrepreneur is ready to put on the table to acquire the company. Most of the owners have put all their energy and time in their company without cashing too much during company lifetime. At the exit time, they might be disappointed. Family companies with a charismatic owner are usually unprepared for a transfer where they have to stay in the company for a period of time (MBO or training of the new owner). They are not used to delegate nor seldom inclined to shed their power gradually. When no candidates are willing to pay the amount hoped for, e.g. in order to avoid the foreclosure of the company, they will prompt a MBO through a member of the management team. Owners of family companies and middle sized companies can be helped considerably by advisers during the preparation of a transmission. When an entrepreneur, a fund, or venture capitalist, want to acquire a company, all will spend much time to evaluate the financial results. All the banks will do the same. Very few analyze the non-financial aspects of a company: quality of the management, IT, production means, distribution networks, staff motivation, perfect fit between products and market demand. These non-financial elements are nevertheless essentials for a complete evaluation of any new acquisition. Whether you are Chairman of the Board, CEO, Managing Director or General Manager within your company, we know that, like all executives, you are alone in the decisions you have to take. Because even if you practice participatory management, there are certain elements of your decision-making where it would be too sensitive to share with your board. We know from experience, that many company heads would like to be able to challenge their ideas with someone who has an identical level of responsibility and comparable experience in company management. We know that they would like to be able to confide specific assignments to consultants who speak the same language as them. Just in Time Management Group provides you this opportunity. Peer to Peer: you will not have in front of you consultants who simply carry out benchmarking and who will advise you to apply standardized solutions. We are a consultancy bureau exclusively composed of Partners who have proven experience in general management and consulting services. Having occupied various positions as board members, CEO, CXO and heads of company, our Partners have chosen to share their know-how, to assist and advise other executives. OLDER POSTIs Website Push Notifications Is Killing The Email Marketing?